According to data tracked by the Energy Information Administration (EIA), diesel prices dipped 8/10ths of a penny to $2.399 per gallon, 11.8 cents per gallon cheaper compared to the same week last year. 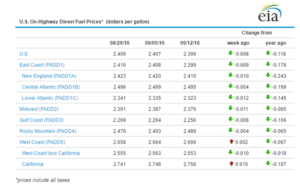 Average prices declined for diesel in all US regions except for California and the West Coast. The biggest declines for the week occurred in the Lower Atlantic, Midwest and New England Regions.